Houzz 90 of our visitors have told a friend about this plan. Question: Does this home have a bonus room Upstairs? 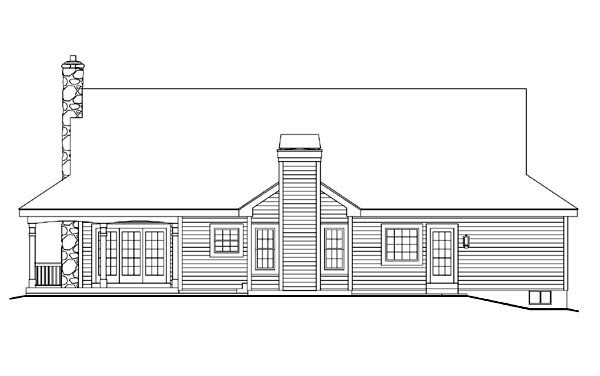 Answer: This plan specifies roof trusses and therefore there is no bonus room as designed. Modified trusses with a change to the stair arrangement could allow for a second level though. 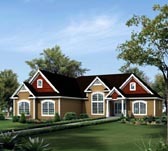 Question: Hi, are any of the dormers in this model open to the first floor as in the four bedroom version of this plan? Answer: There is not. These dormers are for the attic space. Answer: The Breakfast Area is 8’-4” deep and 12’-0” wide. The Hearth Room is 7’-8” deep and 12’-0” wide. 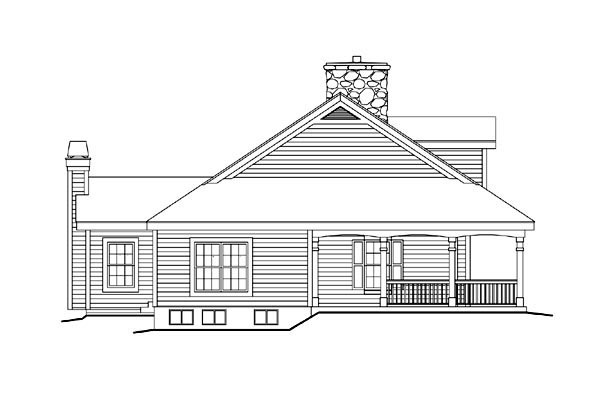 Answer: The ridge height for this house is a little over 23’ above the first floor. The first floor has 9’ ceilings supported by trusses having a top cord (roof) slope of 8/12. 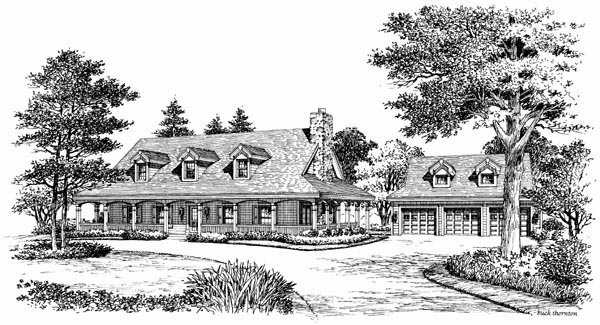 With stick framing or modified trusses and not changing the exterior appearance of the house there would be sufficient room for a second level, except over the great room due to the 5/12 vaulted ceiling in that area. Two of the three dormers could be used for natural lighting. The front to back dimension of the second floor 8’ ceiling would be limited to about 11’ but the floor dimension could be approximately 20’ assuming 4’ pony walls in front and back. Answer: Thank you for your inquiry. The square footage shows the heated and cooled living space as 1944. 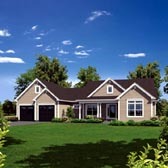 This does not include the garage or porches. Question: What is the measurement of the Covered Patio? Is there a large attic for storage and are the dormers just for looks? How wide does the porch measure? Answer: The covered patio measures 18’ X 10 ½’ and the front porch is 7 ½’ wide while the side porches are just under 6’ wide. The dormers are decorative and the attic is quite large but made up of trusses placed every 2’-0” on center. Question: if the wall between the Great Room and kitchen is removed, how does the ceiling in the kitchen look? Answer: Thank you for contacting us. The ceiling in the kitchen would look the same – it would be a flat ceiling and then the vault would begin where the wall was previously located. The scissor truss ends at that wall so additional support may be needed if the wall is removed. Question: Hi. I understand that this is a 1-story home and that the Great Room has a vaulted ceiling. But, does the rest of the house have vaulted ceilings as well or is there attic space behind the dormer windows. Thanks. Answer: The Great Room is the only room with a vaulted ceiling. You are correct about the dormers, they are not active and are in the attic space. Question: Hello, I want to find out if the walls in the great room (near entryway and kitchen) are load-bearing walls? Answer: The wall between the great room and kitchen/hall/entry is non-load bearing. Question: The two walls on the left side of the great room (adjoining walls to kitchen/entry) - are they load bearing walls? Answer: This plan has pre-engineered roof trusses, so there will be no interior bearing other than the steel I-beam in the basement to carry the load from the floor joists. Thanks. 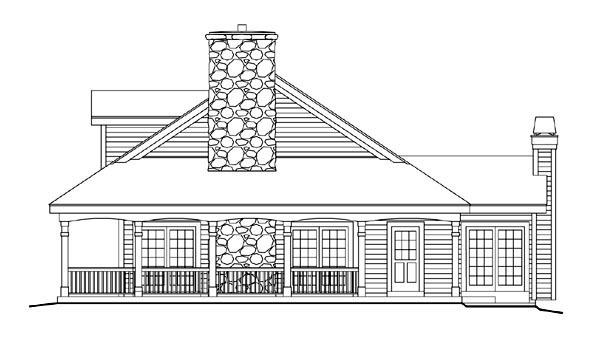 Answer: Unfortunately, there is no attic space in this home plan. The dormers are just for aesthetics. Thanks. Question: could you please tell me how big the laundry room is and the entry way/foyer. Also can this home be a 2 story home? Answer: Below are the room dimensions you requested. The standard plan does not show a 2nd floor, but the plans could be modified by a local architect or engineer using one of our reproducible plan options (reproducible master, PDF file or CAD package). Question: could you tell me how big the laundry room and the entry would be? Also, would you have pictures of the inside? Thank you. CAD file, if ordered, will take 7-10 business days to fulfill.